Anderson signed a one-year contract extension with the Bills on Monday, Chris Brown of the team's official site reports. Anderson is once again inactive Sunday against Detroit, despite having cleared concussion protocol. 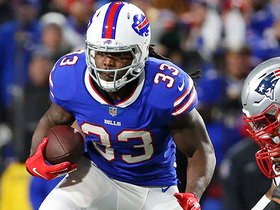 Analysis: Anderson could be available if Buffalo needed him on the active roster, but the team will instead roll with Josh Allen as the starter and Matt Barkley as the primary backup. After several weeks, Anderson has cleared the concussion protocol, Chris Brown of the Bills' official site reports. Analysis: Anderson suffered the concussion all the way back in Week 8, but he's finally received full clearance for all football activities. Unfortunately for Anderson, Matt Barkley looks to have passed him on the QB depth chart, and he may even be a healthy scratch this week against Detroit. Anderson remains in the NFL's concussion protocol and will be limited at practice Wednesday, Matthew Fairburn of The Athletic reports. Analysis: Anderson's continued involvement in practice is a good sign, though he will have to graduate to full participation to rejoin the action Sunday. He still has a couple of days ahead to make that jump, which could position him as a backup option for Sunday's game against the Lions. Anderson (concussion) practiced on a limited basis for the third straight day Friday and was ruled out for Sunday's game against the Jets. Analysis: Matt Barkley will continue to serve as the backup to Josh Allen, while the Bills seemingly have no intention to get Anderson back on the field in 2018. At this point he's around to serve as a good, veteran sounding board for the promising Allen. Anderson (concussion) is still listed as a limited participant for Thursday's practice, Chris Brown of the Bills' official site reports. Analysis: Anderson suffered the concussion all the way back in Week 8, so it's a bit surprising he's not back in full action at this stage. However, as the No. 3 quarterback for a team that wants to get rookie Josh Allen all the playing time he can get no matter how he plays, it's highly unlikely Anderson sees the field again in 2018. Anderson (concussion) remained a limited participant during Wednesday's practice. Analysis: Now that Josh Allen is healthy again, Anderson's Week 14 status is only of import with regard to the Bills' depth under center. Even if Anderson is cleared to play this week, there's no guarantee that he dress ahead of Matt Barkley as the No. 2 option in Sunday's game against the Jets. Anderson (concussion) has been ruled out for Sunday's game in Miami, Chris Brown of the Bills' official site reports. Analysis: Anderson did practice on a limited basis all week, but he still hasn't suited up for game action since suffering the concussion during a Week 8 start against the Patriots. With Josh Allen healthy again and Matt Barkley seemingly passing Anderson on the depth chart, he's working toward getting back to a No. 3/mentor role the rest of the way. Coach Sean McDermott said Anderson remains in the NFL's concussion protocol and will be a limited participant in Wednesday's practice, Joe Buscaglia of WKBW.com reports. Analysis: Anderson also opened Week 12 as a limited participant in practice before sitting out Sunday's 24-21 win over the Jaguars, so it would appear he's made no notable progress in his recovery from the head injury. Even if Anderson passes through the five-step protocol and gains clearance to play this weekend against the Dolphins, it's unclear if he would dress as the No. 2 quarterback behind rookie Josh Allen, as Matt Barkley may have permanently moved ahead of the veteran on the depth chart. Anderson remains in the NFL's concussion protocol as the Bills begin Week 13 preparations, Matthew Fairburn of The Athletic reports. Analysis: Anderson showed some progress by taking part in practice last week as a limited participant but still has yet to receive clearance from an independent neurologist to resume contact work. The veteran quarterback has been sidelined for nearly a month with the head injury and will likely serve as a second- or third-string option behind rookie Josh Allen once cleared to play again. Anderson (concussion) has been ruled out for Sunday's contest against the Jaguars. Analysis: Although Anderson was able to maintain limited showings at practice this week, he didn't make enough progress to complete his journey through the concussion protocol. At the same time, Josh Allen has recovered from a sprained elbow in his throwing arm, setting the rookie up to retake his starting job Sunday. With Anderson sidelined, Allen's direct backup will be Matt Barkley. Anderson (concussion) was listed as a limited practice participant Wednesday. Anderson (concussion) was spotted with a helmet at Tuesday's practice, Mike Rodak of ESPN.com reports. The quarterback still remains in the NFL's concussion protocol, however, Mike Rodak of ESPN.com reports. Anderson remains in the NFL's concussion protocol and wasn't available to practice Monday, Mike Rodak of ESPN.com reports. Anderson (concussion) remains in the concussion protocol, Chris Brown of the Bills' official site reports. Anderson (concussion) has been ruled out for Sunday's game against the Jets, Mike Rodak of ESPN.com reports. Analysis: Anderson was sidelined with his concussion at the Bills' first two practices of the week, and the team has decided he will not be able to make enough progress in the concussion protocol to play Week 10. Head coach Sean McDermott did not reveal his starter for this week at his Friday morning press conference, but according to Joe Buscaglia of WKBW.com, he left the door open for any of Josh Allen (elbow), Nathan Peterman or Matt Barkley to get the nod. Anderson (concussion) was listed as a non-participant in Thursday's practice. Anderson remains in the concussion protocol and won't practice Wednesday, Chris Brown of the Bills' official site reports. Coach Sean McDermott made it clear Anderson (concussion) is ahead of Nathan Peterman in the pecking order at quarterback, Mike Rodak of ESPN.com reports. Analysis: Not that there was really any doubt, but McDermott confirmed Anderson will start against the Jets in Week 10 if he's cleared from the concussion protocol and Josh Allen (shoulder) still isn't ready. The team may want to play it safe with the rookie Allen ahead of a Week 11 bye. Anderson (concussion) has been downgraded to out for Sunday's game against the Bears. Analysis: The Bills never seemed to have much optimism Anderson would clear the NFL's protocol in time for the Week 9 game, especially with one less day than usual to heal given that Anderson suffered the concussion in Monday's loss to the Patriots. With Anderson out of commission, Nathan Peterman will make his fourth career start as the Buffalo faithful collectively holds its breath. Anderson remains in the NFL's concussion protocol and is listed as questionable for Sunday's game against the Bears, Chris Brown of the Bills' official site reports. Analysis: Anderson was listed as a non-participant at practice all week, but the Bills are evidently holding out some hope that the veteran signal-caller will be medically cleared in advance of Sunday's 1 p.m. EST kickoff. For now, the assumption is that Nathan Peterman will operate as the Bills' starting quarterback this weekend with Anderson still working through the concussion protocol and Josh Allen (elbow) ruled out. Coach Sean McDermott said Friday that Anderson remains in the concussion protocol, Matthew Fairburn of The Athletic reports. Analysis: McDermott also said the team has received no indication from doctors whether Anderson is likely to clear the protocol, leaving his status for Sunday's game against the Bears questionable at best. Nathan Peterman would start at quarterback in Week 9 should Anderson ultimately be ruled out, with the newly signed Matt Barkley serving as the backup. Anderson (concussion) wasn't spotted on the field for Thursday's practice, Joe Buscaglia of WKBW.com reports. 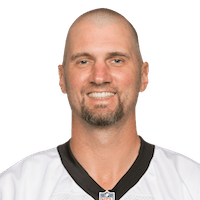 Analysis: Anderson will go down as a non-participant for the second straight day of practice, which further supports the notion that the veteran signal-caller won't be ready to go for Sunday's game against the Bears. The Bills are expected to start Nathan Peterman in the Week 9 contest, with the newly signed Matt Barkley on hand for backup duties while Anderson remains stuck in the NFL's concussion protocol. Coach Sean McDermott said Anderson (concussion) won't practice Wednesday, Matthew Fairburn of The Athletic reports. Anderson (concussion) isn't expected to be available to start Sunday's game against the Bears, Adam Schefter of ESPN reports. 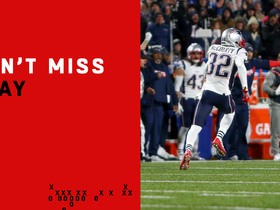 Analysis: Anderson exited Buffalo's loss to the Patriots in Week 8 due to a concussion with just over a minute remaining in the fourth quarter. The veteran appears unlikely to clear the league's concussion protocol in time for the weekend, so Nathan Peterman is expected to start under center with rookie first-rounder Josh Allen (elbow) still sidelined. The Bills could add another quarterback to the roster in the coming days if Anderson isn't fit to serve in a backup capacity. Anderson completed 22 of 39 passes for 290 yards and an interception in Monday night's 25-6 loss to the Patriots. He also lost a fumble while being sacked three times before leaving the game with an injury on the last hit. Anderson (back/calf) is good to go for Monday's matchup with the Patriots, Matthew Fairburn of The Athletic reports. Analysis: With rookie Josh Allen (elbow) out again, Anderson is slated to draw another start under center. The 35-year-old completed 20 of 31 passes for just 175 yards in last week's loss to the Colts, and also turned the ball over four times. 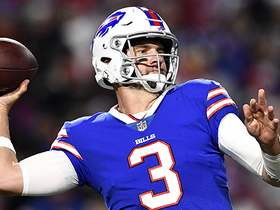 He will get a chance for redemption Monday against the Patriots, but Nathan Peterman will also be available if Anderson struggles again early or suffers some type of setback. Anderson (back/calf) was limited at Friday's practice. Analysis: The 35-year-old quarterback is tending to a few injuries after his first start with the Bills, which did not go swimmingly this past Sunday at Indianapolis. Despite completing 20 of 31 passes, Anderson racked up just 175 yards and committed four turnovers. 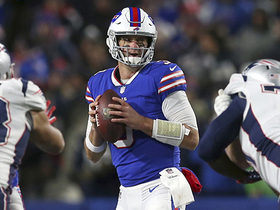 He's slated to start again Monday night versus the Patriots due to Josh Allen's sprained elbow, but Nathan Peterman also will be available in the event Anderson can't get through the entire contest. Anderson (back/calf) was listed as a limited practice participant Thursday. Anderson will get the start Week 8 against New England, Mike Rodak of ESPN.com reports. 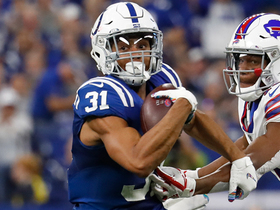 Analysis: Anderson's four-turnover, 175-yard performance in Sunday's 37-5 loss to Indianapolis wasn't enough to lose the starting job, as Josh Allen (elbow) still isn't ready and Nathan Peterman has been a complete disaster. The Bills are likely to be overmatched on Monday Night Football, though their defense has at least put up at fight in home games this year. Anderson completed 20 of 31 passes for 175 yards with three interceptions and a lost fumble in Sunday's 37-5 loss to the Colts. Analysis: Anderson, who was out of football earlier this season, was thrown into a nightmare situation. With limited time to learn the offense and arguably the league's weakest skill position group around him, few can blame Anderson for his poor performance. If starter Josh Allen (elbow) remains sidelined in Week 8, Anderson will be fighting an uphill battle against the Patriots on Monday Night Football. Coach Sean McDermott named Anderson the Bills' starting quarterback for Sunday's game against the Colts, Ian Rapoport of NFL Network reports. Anderson's teammate Josh Allen has been diagnosed with an injured ulnar collateral ligament in his right elbow and is considered "week-to-week" by coach Sean McDermott. Anderson saw action in three games this season, completing two of eight attempts for 17 yards. Analysis: Anderson joined the Panthers in 2011, the same year they drafted Cam Newton first overall. A reliable backup to Newton since then, Anderson will be an unrestricted free agent this offseason. Considering he'll be 35 years old once next season kicks off, Anderson should receive mild interest from teams looking for a second-stringer, should he decide to keep playing. Anderson (illness) isn't on Wednesday's injury report, Jourdan Rodrigue of The Charlotte Observer reports. Analysis: Anderson dealt with an illness earlier in the week but apparently is healthy ahead of Sunday's game against the Jets. He'll continue serving as Cam Newton's (thumb) backup. Anderson was held out of Monday's practice due to an illness, David Newton of ESPN.com reports. Analysis: Like Anderson, third-string quarterback Garrett Gilbert was also absent from the practice due to an illness, leaving Cam Newton as the only healthy signal caller on the roster. The Panthers will likely quarantine both Anderson and Gilbert to avoid contaminating Newton or any other players, but head coach Ron Rivera is hopeful that at least one of the two quarterbacks will be healthy enough to dress for Sunday's game against the Jets. New England Patriots defensive back Devin McCourty runs 84 yards on a pick-six. 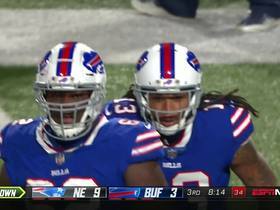 Buffalo Bills wide receiver Kelvin Benjamin out-jumps New England Patriots cornerback Stephon Gilmore and catches for a 40-yard gain against the New England Patriots for Week 8 of the 2018 season. The Buffalo Bills attempted four trick plays in a row for their opening drive against the New England Patriots. 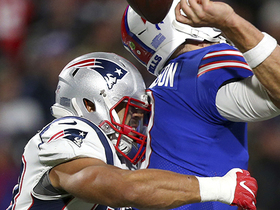 New England Patriots linebacker Kyle Van Noy surprises Buffalo Bills quarterback Derek Anderson from behind with a sack that resulted in a fumble. 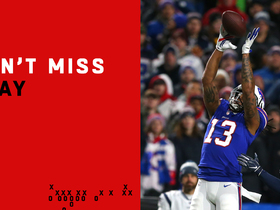 Buffalo Bills wide receiver Kelvin Benjamin reaches up with one hand for a 5-yard reception. Buffalo Bills quarterback Derek Anderson launches a throw to Buffalo Bills wide receiver Andre Holmes for a 21-yard gain against the New England Patriots. Buffalo Bills quarterback Derek Anderson lofts pass to wide receiver LeSean McCoy for 24 yards. Buffalo Bills quarterback Derek Anderson throws a first down pass to Buffalo Bills wide receiver Andre Holmes who reaches low for the catch. 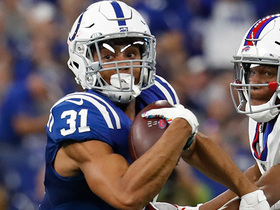 Indianapolis Colts cornerback Quincy Wilson falls short to the end zone after recovering Buffalo Bills quarterback Derek Anderson's fumble.